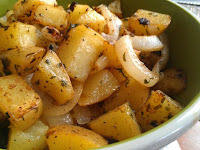 The highlight of this side dish for me was the onions. Now, it makes a big difference in the type of onion you use sometimes. This is one of those times. 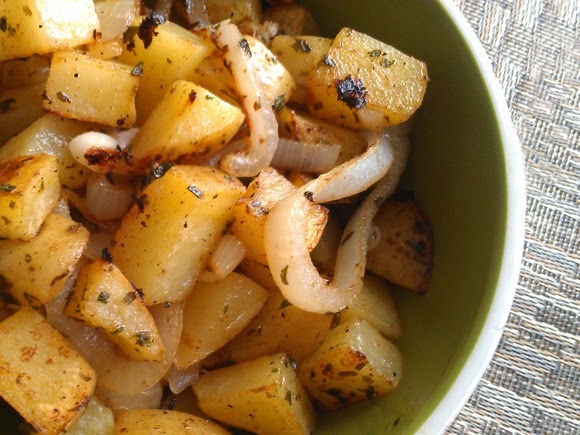 You can definitely use any onion, but vidalias are like the king of onions. Or queen. Hmmm.... Anyways, these are the best onions for almost anything. They're sturdy, sweet, packed with flavor (and vitamins!) and I've even heard of people eating them like an apple! I'm not one of them, but I can (just about) see why they do. These are mild onions in terms of that onion-y harshness and they can withstand just about anything you can throw at them. So if you can get your hands on some vidalias, do it! They are only around for a short time here by me so I get a big bag at Costco. Can't go wrong! 2. Spray a foil-lined baking sheet with non-stick spray. 3. Toss all ingredients together and spread on baking sheet. 4. Bake for 20-25 minutes or until golden brown. Stir halfway through cooking time for even cooking.